The plans include a new outdoor market, major improvements to the Eastern Hall and an improved entrance, as well as structural repairs. 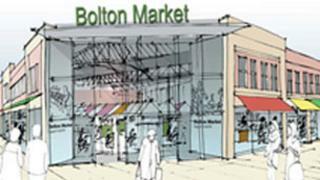 Bolton Council's executive will make a final decision on the Ashburner Street market proposals on 5 December. Council leader Cliff Morris said: "[We] need to safeguard this vital asset for the future." If it gets the go-ahead, the project will coincide with regeneration work around the market, including a new transport interchange due to be finished in 2014. Traders were briefed on the refurbishment plans on Tuesday. Keith Davies, director of development and regeneration at the authority, said the meeting with stall-holders was "a positive start to discussions". Mr Morris added: "We will work closely with the traders, consulting with them regularly and involving them in key decisions. "As part of the work towards this redevelopment, traders will be consulted at regular intervals and kept up-to-date." The Bolton branch of the Market Traders Federation is yet to comment on the plans. Bolton has had a market for more than 750 years. The 300-stall market was named Best Indoor Retail Market by the National Association of British Market Authorities in 2010, and Tourism Retailer of the Year 2009.